Ben introduces me me to the stunning photography of Jered Gruber. 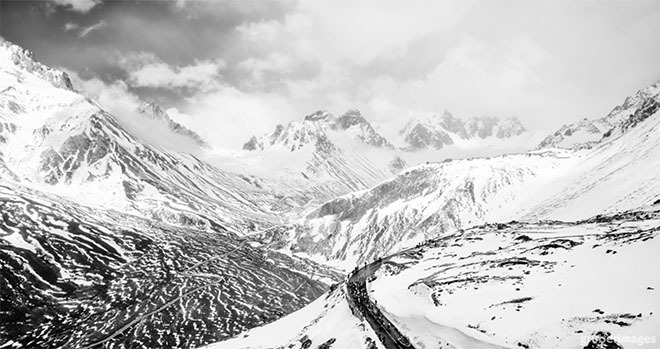 In his shot of a snow-capped Galibier, playing host to the battered peloton as they weave bravely towards the summit; it’s easy to see why the Giro d’Italia is both a beauty and a beast. This is Italy. There’s a lot to celebrate in the world of Italian cycling this year: Vincenzo Nibali is donning the Maglia Rosa – the Leader’s Pink Jersey, and is very likely going to win the entire La Corsa Rosa. If you’ve ever made a double-take when admiring a bicycle, then you’ve probably clocked onto a Campagnolo groupset; now commemorating their 80th anniversary. Thanks to ‘Campag’, they have kept wheels turning effortlessly in motion for many happy cyclists. Sports car manufacturer, Lamborghini are also in the mix; marking their 50th by producing a racer with the bike people over at BMC. And with continental teams such as Vini Fantini showing they can compete with the worlds finest, it’s no wonder this year’s Giro is proving to be a success! So it might be apt that today’s stage, number 19, is now cancelled due to bad, I mean horrendous weather conditions; a timely reprieve perhaps for worn out cyclists, red-jersey contenders, and those with frozen toes. As for us, this is an excellent opportunity to pause and examine the people who have made the Giro d’Italia a race worthy to behold. The Fifth Dimension: These 3 Cyclists have won the Giro a record 5 times! 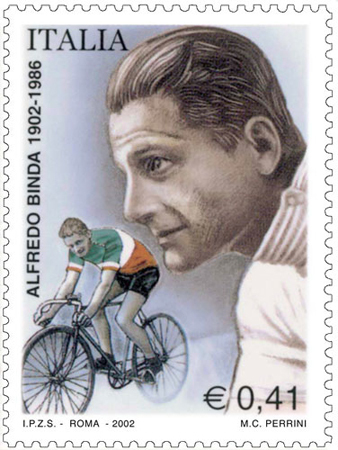 Alrfredo Binda – The first ‘superstar’ of the Giro d’Italia and the silent hero of the 1920’and 30’s. 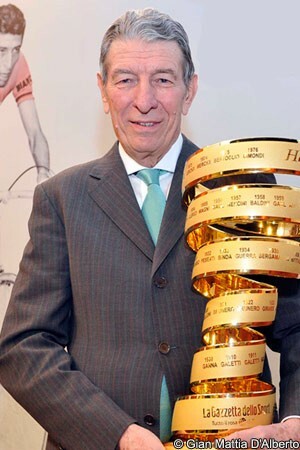 Later Alfredo was to become the trainer to both Fausto Coppi and Gino Bartali. The significance of which is truly remarkable. To this day, not only do they rank highly on the list of Giro greats, but in the world of cycling as a whole. Eddy Merckx – considered to be the greatest pro-cyclist ever, he is also the only non-Italian to wear the Maglia-Rosa a record 5 times. This and much besides! Giovanni Brunero – His first year as a pro, Giovanni came fifth in the classic Milan San Remo and carried on in his career to secure 3 more Giro’s. Gino Bartali – Described as the ‘George Best of Italy’, Bartali is also the most renowned Italian Cyclist before WWII. 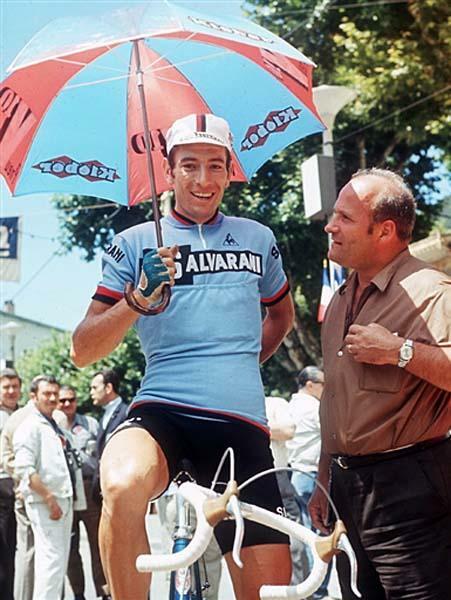 Gino was a powerfully built rider and proved a worthy champion of the Giro. At the age of 20 he won the Pink. At 22, not only did he succeed again, but also secured the podium at the Giro di Lombardia. Sadly, this was to be overshadowed by the death of his brother through a racing accident, and almost putting an end to Bartali’s career. He was persuaded to return the following year and it is at this time that Italian cycling was to enter its golden era. His partnership with Fausto Coppi and Fiorenzo Magni, continues to stir the imagination of people today. But it is Bartali’s WWII humanitarian efforts that are only now being discovered. A devout Christian, it was his belief that moved him to be an active helper. He personally transported counterfeit identity papers and even harboured Jewish families in defiance to Mussolini’s fascists. On his return to the sport he was unceremoniously named ‘Il Vecchio’ – the ‘Old One’. Bartali’s double-life had taken its toll on the athlete. Not only did he appear years older, the rations of the time meant he physically was not the same man. Moreover, the terror of the controlling regime had consumed Bartali with fear – secret-police interrogations, threats to him and his family: his wife and young son. Yet in 1948, Bartali once again took to his bicycle and rode the Pyrenees for Le Tour; amazing everyone bywinning the maillot-jaune. Some 10 years after his last victory – a record that stands to this day. 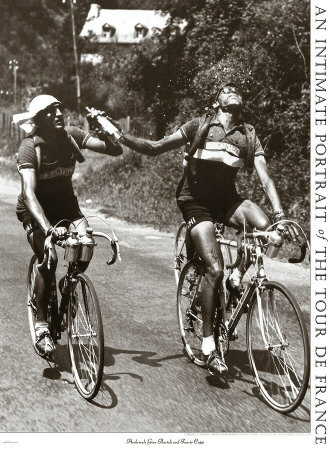 Bartali and Coppi sharing a drink, or perhaps not. Fiorenzo Magni – often described as the ‘Third Man’ of Italian Cycling to Coppi and Bartali. Fiorenzo not only holds 3 Giro’s between 48-55, but three consecutive wins of the Springs Classics, the Tour of Flanders (49,50, and 51) On his retiring year on stage 12 of the 1956 Giro, having broken his collar bone, Fiorenzo refused to be put in a cast. Instead he soldiered on. 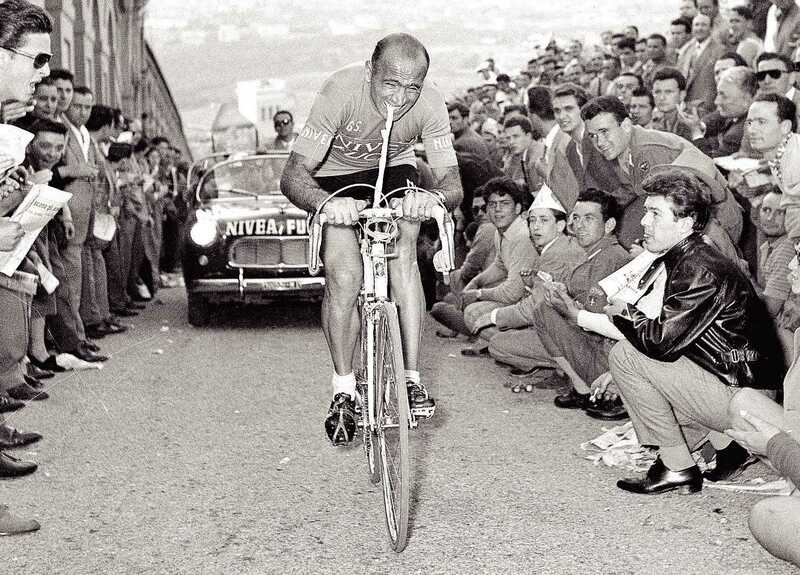 Just as innovative as our modern day Adam Hansen, Magni famously attached a rubber inner tube to his handlebars and steered it with his teeth in order to race. On stage 16, Magni crashed on a descent and having passed out from the pain of further breaking his humerus, he was placed in an ambulance. When he awoke, he shouted and told the driver to stop. He then took his bike and finished the stage with the awaiting peloton. Snow and ice On stage 20, caused 60 riders to abandon and cleared the way for Luxembourg’s, Charly Gaul to claw back from 16mins behind and to past the finish line as the winner of the 56’ Giro. 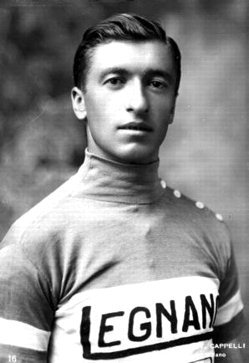 Despite his injuries and the harsh weather conditions, Fiorenzo Magni came second. Fiorenzo Magni – navigating with an inner-tube! If parental influence can have a positive impact on a child’s life, then Felice’s mother may have imparted some of her positivity. Ms. Gimondi regularly took her son cycling on her daily rounds as a postal courier. What a good day at the office that would be. 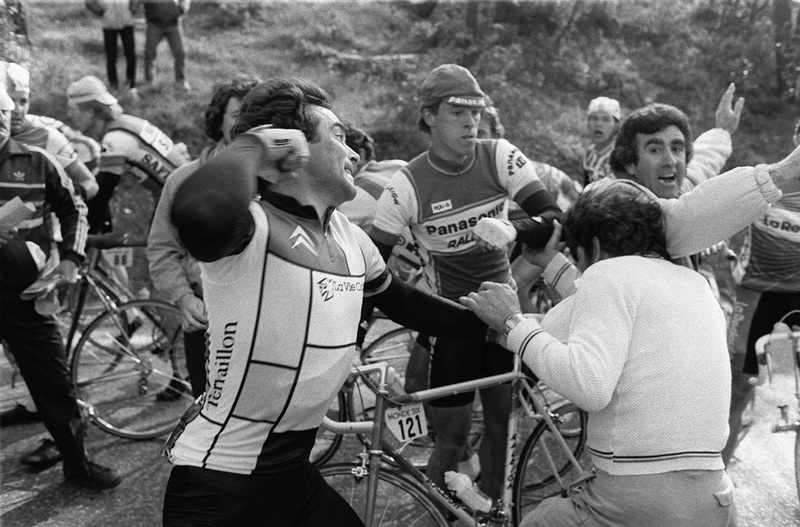 This makes me wonder: did Bernard Hinault instead opt to attend Boxing School? Badger Power: Never, ever separate a cyclist from his bicycle. Ever! Bernard Hinault – Affectionately known as the ‘Badger’, Bernard earned his moniker through his resemblance to a traditional shaving brush when donning a sweatband. All the same, Bernard was not a man to mess with. The original ‘Boss of the Peloton’, Hinault commanded respect and cooperation from his peers. Although not a crowd pleaser, he continues to attract a wide fan base. When asked about his responsibility to his community of fans, he would reply: “I race to win, not to please people”. In 78’, he was hailed as the next great French Cyclist. Perhaps in response to this, Bernard set his sights on Le Tour, and won the Vuelta in the same year. In 79’ he won the tour again. The following year, Bernard won his first of three Giro’s. He is still recognised as the outspoken Le Patron of the cycling fraternity. For those of you who are still dreaming of cobbles, then the charm of Rome’s very own streets might capture your imagination. Everyone from: village-folk, to classic frame-building mentors; from WWII heroes to early innovators, have all left their mark on the Giro. With such colourful lives, it is little wonder that the Leaders Jersey is Rosa! Does anyone know here I could get a poster or photograph of the inner tube picture above?